Pimento cheese with bacon, garlic, cayenne and green onions. 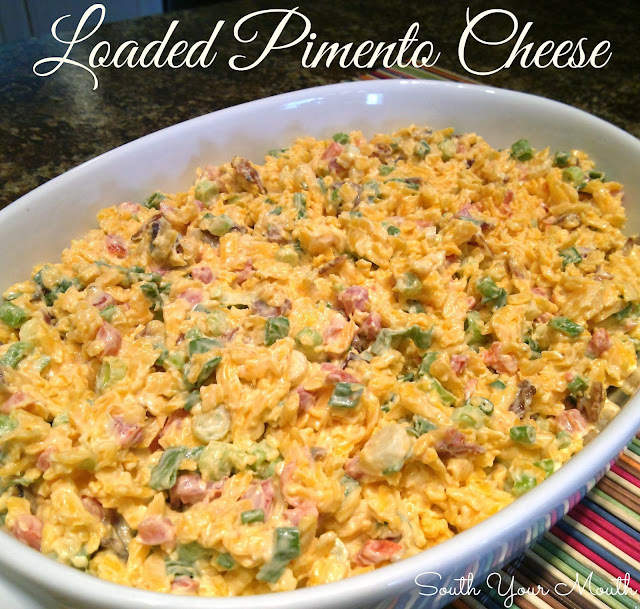 I started to make the Baked Pimento Cheese Dip the other day and got hung up. I whipped it up, spread it into the baking dish and had a moment. You know? A moment. I just stood there looking at it before it was baked and thought, maaaan DANG, that looks good just like that! I had some veggies out that I’d chopped for the little snackers so I grabbed a celery stick, loaded it up and took a big ole bite. P.S… everybody I've talked to in LA lately says totally all the time. It’s like the 80’s are back in full force out there. Again. Totally. The irony of me poking fun at someone else’s funny saying is not lost on me. Anywho, the next time you want to make regular Pimento Cheese think about trying this version out! The crisp green onions, creamy cheese and chewy bacon make for a total texture party in your mouth. Totally. Shred cheese* then add to a medium-sized mixing bowl. Add cooked bacon, pimentos, mayonnaise, salt, cayenne pepper and garlic then mix well until all ingredients are thoroughly incorporated. Fold in green onions. Spread cheese mixture into a serving bowl and refrigerate until ready to serve. Serve as a sandwich spread, atop burgers or with crackers, pita wedges, celery sticks or anything else your little heart desires. *You really, really, really need to shred your own cheese when making Pimento Cheese. why is it necessary to shred your cheese? Whats the difference between it and whole block? Pre-shredded cheese has lots of additives in it to prevent it from caking and sticking together so the pimento cheese won't get as creamy as it should. It's also much softer and more moist than pre-shredded cheese. I have found that the pre-shredded cheese does not work at all for pimento cheese and doesn't melt like I want it to in casseroles. Therefore, I always grate my own cheese on an old fashioned hand grater.